This morning, the Arkansas Realtors® Association (ARA) released home sales statistics for the month of July. As anticipated (see previous post), sales were down sharply from the previous month and were substantially lower than the previous year. Compared to July 2009, Arkansas home sales were down 31.6 percent. As shown in the chart below, home sales during 2010 have followed an unusual seasonal pattern. Typically, sales peak during the mid-summer months (usually in July), then taper off over the remainder of the year. This year, the peak came early. The reason, of course, was the availability of tax credit for home buyers, which expired at the end of April. To qualify for the credit, a contract needed to be in place before May 1, but the actual closing date could be later. Hence, sales figures for May and June were supported by the lingering effects of the credits. The steep decline in July reported this morning mirrors the pattern we saw in the national data for new and existing home sales, and reflects the fact that most of the contracts that were eligible for tax credits have already been closed. The big question is how the rest of the year will develop. Temporary subsidies and incentives tend to shift demand from one time period to another. Many of the home sales that took place in the first half of 2010 would have probably occurred later in the year were it not for the tax credit deadline. The key issue is whether there is substantial demand remaining to support the market after the hangover ends. In this regard, forecasts are necessarily uncertain. Some specific fundamentals suggest that there may be some limited recovery of the market during the fall months: House prices remain somewhat weak and mortgage rates are at historic lows — it’s still a buyer’s market. There will continue to be routine demand for homes associated with relocations. On the other hand, the slow recovery of employment has sapped some strength out of consumer confidence, so there is apprehension about making the kind of long-term commitment that is entailed in buying a house. 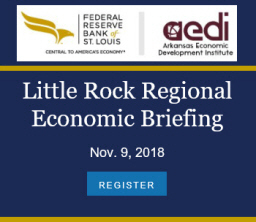 Since Arkansas has not suffered the magnitude of job losses seen in other parts of the country, and is showing some signs of recovery, we can be hopeful that this will not be a significant damper on housing demand during the remaining months of 2010. The full report from the ARA (Excel spreadsheet) can be downloaded here.